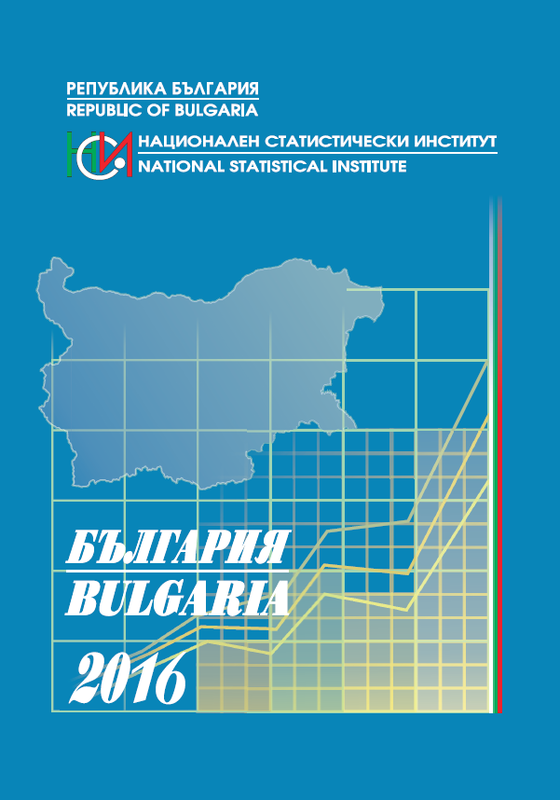 The National Statistical Institute presents the bilingual (Bulgarian/English) brochure Bulgaria 2016 to users of statistical information. The brochure is addressed to a wide range of users (international institutions, businessmen, students, experts etc.) and changes the traditional presentation of statistical information by offering an innovative structure with a parallel translation in English. The publication contains topical statistical information about the demographic, social and economic development of the country over the 2011 - 2015 period. It also includes non-traditional information of interest to users presented in tables and diagrams following international tendencies in the publishing of statistical advertising publications. Information sources are the single and regular statistical surveys carried out by NSI and by the institutions indicated as bodies of the statistics according to the Law on Statistics. Data obtained by the Geodesy, Cartography and Cadastre Agency at the Ministry of Investment Planning and by the National Institute of Meteorology and Hydrology at the Bulgarian Academy of Sciences are also included. The compiled information covers the government system, geographic location, climate and population, as well as the socio-economic development of the Republic of Bulgaria. A comparison between Bulgaria and other countries in Europe and the world is made on the basis of a number of indicators. The contact addresses and phone numbers of the NSI Head Office are also listed. The publication includes a list of the bilingual publications of NSI, as well as those published only in Bulgarian and in English. The issue is freely disseminated.